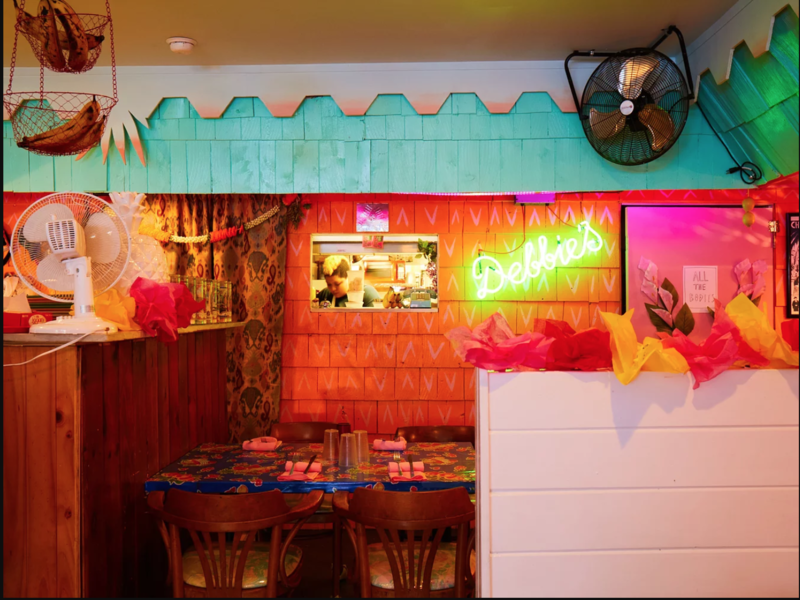 Self-described "tropical comfort maximalists," Carla Perez-Gallardo and Hannah Black have created a bright, funky, queer-friendly coastal vibe in their restaurant Lil Deb's Oasis. The laidback feels and inventive Latino menu of this converted neighborhood diner has earned Lil Deb's a cult following in Hudson. Layla Kalin, owner of the avant-garde Japanese fashion boutique Kasuri, told Chronogram last year that Lil Deb's is her favorite spot in town. 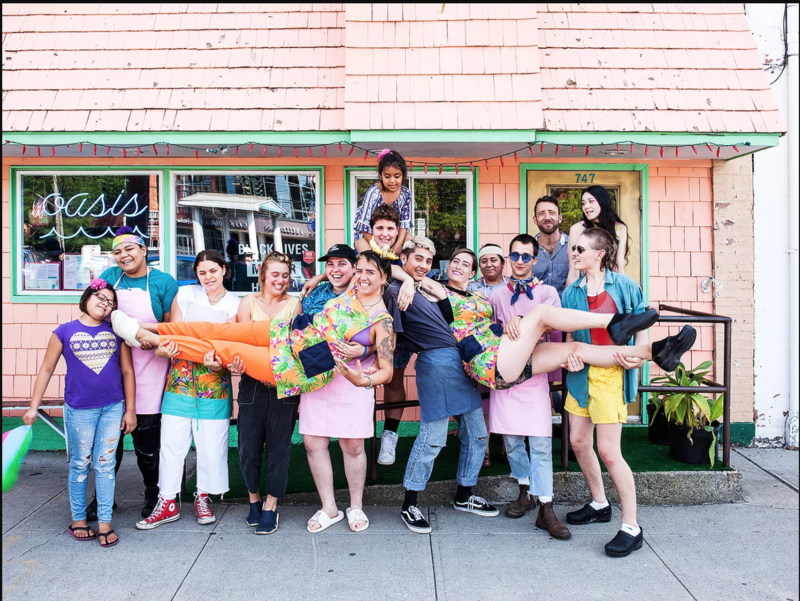 "That restaurant is bomb on so many levels—the food is amazingly adventurous and bright, the staff is to die for, the interior is fun and cozy, the vibe is forward thinking and radically inclusive," Kalin says. "Dinner there is always popping, and as a mom I don't make it out often. But since they started serving lunch, I can pop in for some sustenance and happiness regularly now!" 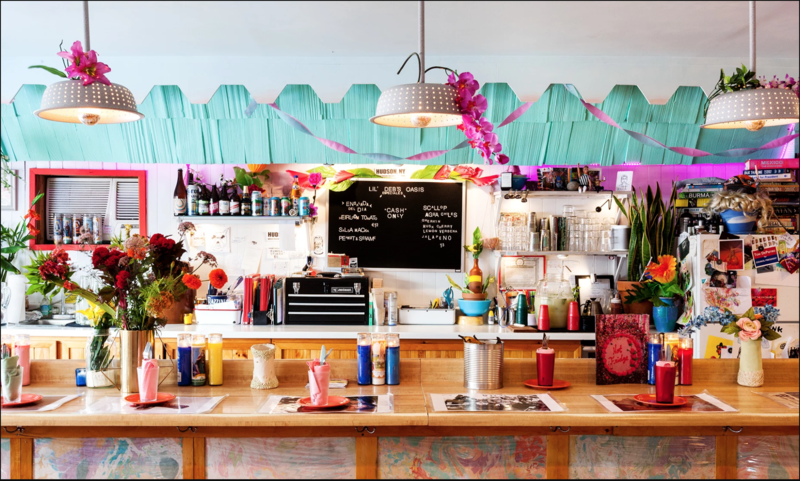 There is already plenty of great coverage of this effortlessly cool spot (check here and here), but we wanted to get to know the proprietors a little better. So we sat down with Carla and Hannah to play a round of 20 questions. 1. Name your major culinary influences. Ines (Carla's grandmother), Gordon Matta Clark + Carol Gooden's Restaurant Food, Angela Dimayuga, Gerardo Gonzalez, Devonn Francis, our peers doing important work in the food world. 2. What's the best meal you've ever had? Wood fired rotisserie chicken on the side of the road in Mitla, Oaxaca. Crispy skin, served with potatoes cooked under the drips of chicken fat, and little salsas in baggies. We were definitely licking our fingers, and totally inspired to try to recreate those flavors at home. 3. What is your go-to comfort food? 4. It's Sunday morning. What's for breakfast? breakfast salad, with a perfectly poached egg (6 minutes), side of bacon. ginger coffee, fresh juice. 5. Three of your favorite local restaurants? Hudson Curry House, Sylvia's in Woodstock, the Tavern at Rivertown Lodge. 6. What's so great about Hudson, anyway? We love our community in Hudson—it is diverse, passionate, and socially active. People make things happen here, and really gather around to support each other and makes each other's visions a reality. 7. Where do you see yourselves in five years? Traveling to all the places we dream of going and taking our project with us. Working more deeply at the intersection of art, food and social activism. Having a bigger space to host events and projects that are meaningful to us. 8. What's your favorite movie ever? 9. Name three records you've been into this year. Tierra Whack's Whack World, Colin Self's soon-to-be released album Siblings, and of course—A Star is Born Soundtrack. 10. Where do you go to clear your head? 11. What's your favorite Hudson Valley town to hang in (besides Hudson)? 12. What's your favorite food city, domestic or international? 13. Three people (dead or alive) you would invite to your Last Supper. 14. What would you be doing if you weren't cooking? International DJs/hype team! Or Carla's other dream as a forensic pathologist. 15. If you were able to reincarnate as any animal, what animal would it be? 16. What's your favorite dish on the menu right now? 17. Any good stories from Deb's? 18. What keeps you up at night? The current political climate, how to keep our staff and ourselves healthy, happy, and inspired, and the financial realities of running an alternative, socially- conscious business in a capitalist society. 19. What motivates you every day? The community/family we have built! We wake up every day for them, we work for and with them, we love and build together! 20. How do you deal with an, um, "challenging" guest? Usually we send Hannah over to sweet talk and offer them something to make their experience better because our hope is that everyone leaves happy. Right before we opened the restaurant, we read Danny Meyer's Setting the Table and really took to heart his idea of offering an intentional, warm gesture to any unhappy guest as a way to truly bridge any difference or displeasure. Of course, we've had moments of wanting to put our foots down with a rude customer—and have realized that in the hospitality industry it's also important to recognize those thresholds between customer service and customer abuse, and to be able to calmly make our boundaries clear.